340 litre ,1260 mm diameter circular pond . 80 litre, 540 mm diameter reservoir. 350 litre, 1140 mm diameter reservoir. Our large range of reservoirs are designed specifically for water features. Many of our reservoirs come complete with a cover in galvanised steel, PE or fibreglass (capable of supporting 200kg or more with support column). 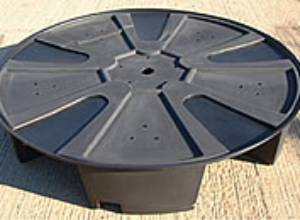 These water feature containers can be placed level with the ground or raised. All the reservoirs with lids are ideal for creating Pondless water features.